K-Sun LABELShop BEE3-EZ Shrink Tube & Label Printer - The K-Sun BEE3-EZ is a compact keyboard printer that creates custom adhesive-backed labels in over 60 different sizes and color combinations. It also can print on polyolefin heat shrink tube materials for wire and cable identification. Prints 8-Bar Code formats for making custom bar code labels for multiple uses in warehouses, plants, labs, electrical, office, maintenance and more. 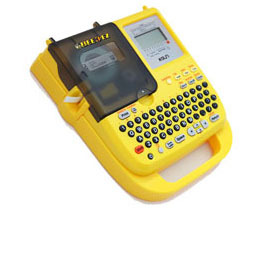 The BEE3-EZ printers are loaded with features to make labeling easier and better. Below is a list of key features that add up to a performance package you would expect only from larger, more expensive label printers. • New Hot Keys make it very EZ to select type size and font styles eliminating confusing menu prompts. • EZ snap-in cartridges for custom polyester adhesive labels, heat shrink tube supplies, fluorescent, magnetic, fabric, and glow-in-the-dark labels from 1/6" up to 3/4" wide. • Eight new bar code formats for EZ identification requirements. • New hot key for EZ access to cable/flag label formats. • 3-year unconditional warranty for EZ fix to any problem. Best in the business! Includes: Labelshop BEE3-EZ Printer, (1) 1/2" Black on White Tape, Ac Adapter & Owners Manual.